One of my brothers-in-law always asks me a question that seems to me to be a perfect conversation-starter. Anytime we're gathered together and have a minute to talk, he asks, "What have you been reading lately?" I love this question so much more than my typical, "What's up?" or "What's been going on lately?" because it naturally lends itself to deep conversation about what really is going on in our lives. My go-to question can be easily side-stepped with a simple, "not much", but his question leads to so many possible follow-up questions. If I'm not reading anything at the moment, the natural follow-up is to ask why not, which may reveal a multitude of things going on in our lives. If I have something really interesting that I am reading, we can talk about that and why I like it, which tells a little about me and what I've been thinking about. If I'm reading a parenting book, the conversation may then lean towards what's going on with my kids. The possibilities are endless, and the meaningful conversations that have stemmed from his question have been so enriching and encouraging. I love his question. While no reader here is begging me for the answer to what I'm currently reading, I do have lots of requests for book suggestions for kids. I'm always happy to share some great titles or to point people in the direction of some great resources. In fact, our After-School Program includes access to lists of books for students to read by grade-level (and the freedom to check those books out of our library). My lists aren't ground-breaking. In fact, they're compiled from multiple trusted resources, many of which are easily accessible. Still, the long lists can be daunting, and parents are often overwhelmed with where to begin and how to find something on the list that their kids will really like. Finding a child's interest can admittedly be hard, but it's not something to get too worried about. Try lots of different books. When something sticks, it'll open up a wide world for your child that you didn't know was possible. If you haven't found that book yet, move down a reading level and see if reading something a little more simple does the trick. You probably hear this all the time, but reading to your kids does absolute wonders for their love of reading. Read out loud to them to find their interest areas and then go from there. Even if your kid doesn't seem to like it, they will almost always choose for you to read out loud to them over going to sleep. Bedtime is a great time for reading books because there isn't anything else to distract them and they may end up begging you to read more. Now, this is a hard time because you are probably incredibly distracted and ready for some downtime and relaxation. I know. I've been there and I've cut reading time short just so I could get a little time to chill. But there's no denying that bedtime is usually a time you have your kids' undivided attention. Why not use it to promote a love of stories that turns into a love of reading which lends itself to a love of learning? Today is the first installment of "Monday Media Review" where we take a look at all sorts of different media, ranging from books to music to videos. The aim, of course, is to provide you readers with an honest perspective on both some great resources to incorporate into your family's lives and some questionable resources you should think about before investing in. 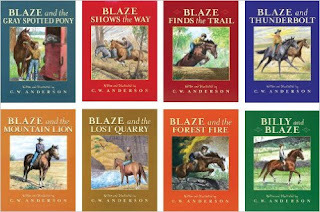 The first book/series I'd love to review and recommend is the Billy and Blaze series. These books truly captivate young readers. My son loved to read these stories at 3 and still asks us to read them to him at 5 years old. I once read Blaze and the Forest Fire at our sweet co-op preschool, and the kids (age 3-6) literally stood up and gasped as I got to the climactic point in the story. The Classical Connections Library can't keep these books in stock. Every volume is checked out nearly every week by 1st and 2nd graders. The stories about a boy and his horse feel like "big kid" stories because they're exciting to young readers, but they are also easy to read. Essentially, each book is a long picture book with a really engaging plot set in a time when young kids had a lot more freedom than they do now. The stories truly are timeless. The illustrations are intricate and fascinating, but they don't take away from the actual story. Young children are drawn to the young hero who demonstrates bravery, but also learns valuable lessons along the way. There are always students who try to read at or above their grade level simply because their friends are doing so, and this series is an easy one to recommend because kids from all ages love the stories and struggling readers don't feel like they're being forced to read a "baby story". If this recommendation isn't enough, take the word of Michael O'Brien's Landscape of Dragons, Providence Classical School, Honey for a Child's Heart, and almost any other wholesome recommended reading list. C. W. Anderson's most popular series is a hit for very compelling reasons. The first one I read and loved was Blaze and the Forest Fire, but my son is completely fascinated with Blaze and the Mountain Lion. I don't think you can go wrong with any of the books in this series, so give it a try and let me know what you think! I really loved the sentence as a conversation starter and I agree that even if a person is not reading anything it would still tell a lot about him.